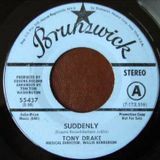 Dominic Pastafasuli&apos;s "Dis & Dat" show - Sunday - July 2.. recent 45 finds from rekkid hunt trip . Dominic Pastafasuli&apos;s "Dis & Dat" show for Tuesday - April 11 -soul uptempo, few slowies. Dom does a smooth soul ballad hour on a Sunday.. snoooze away!!! Faggetabouttit! Dominic Pastafasuli on a Tuesday.., back from vacation, a little bit of "Dis & Dat"- Faggetaboutit! !